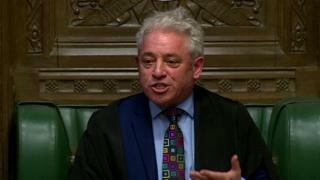 Tuesday's newspapers are dominated by pictures of the Speaker of the House of Commons, John Bercow, alongside almost universal talk of a "constitutional crisis". The Daily Express calls him "the Brexit Destroyer" for ruling out a third vote on the prime minister's deal unless there are substantial changes to it. The paper talks of "an ambush" and a "shattering blow" to Theresa May's drive to win the backing of MPs for her withdrawal agreement. Number 10 is accusing Mr Bercow of "sabotaging Brexit", according to the Times. A government source tells the paper the Speaker has "conspired with MPs" to make a long delay in the Brexit process more likely. Meanwhile, the criticism of Mr Bercow's decision gets more personal in the Daily Mail. It accuses him of "grandstanding" and captions its front page picture with the words: "Smirk that says Brexit be damned". Some of the sketch writers have their knives out too. The Mail's Henry Deedes describes Mr Bercow as a "twitchy windbag" at his "despotic worst". The Times' Quentin Letts says the Speaker had the air of a "psyched-up vandal". England could run short of water within 25 years, according to a report in the Guardian. It covers a warning from the head of the Environment Agency that the nation is facing what it calls "the jaws of death" - a term for the point where demand from a rising population meets a falling supply due to climate change. Sir James Bevan tells the paper the population needs to take action, and to make water wastage socially unacceptable. Other suggested solutions are desalination plants and building mega reservoirs which would prove highly controversial. Meanwhile, the Daily Telegraph reports on a new trial of a herbal remedy to try to cut the amount of antibiotics given out by doctors. Twenty GP surgeries in south-east England will take part - prescribing a South Asian leaf extract called andrographis, to patients suffering from colds and flu. Some people will receive a placebo instead. Previous experiments have suggested the herb can ease sore throats and coughs. The paper says if patients find the treatment acceptable, larger trials will follow. A giant sculpture of a female figure being taken through the streets of Plymouth is featured in several papers, but it appears to be dividing opinion. The Guardian says some have suggested the huge bronze statue, called Messenger, looked more like a skateboarder or a sumo wrestler. The Sun adds that there have been complaints it demeans women, as people will be able to walk directly underneath it. The Daily Mail has reproduced a famous B-movie poster suggesting the pose resembles that in The Attack of the 50ft Woman.